(not in order) Small Angle - E65 , Medium Angled Shading - E70, Large Shader - E60, Pencil - E30, Large Angled Contour - F40, Large Powder - F30, Duo Fibre - F50, Foundation - F60, Concealer - F70, Tapered Blending - E40, Eye Shading - E55, Eyeliner - E05. Click here to have a look at the selection they have on their website. I'd love to know what you think of these brushes, and if you'll get some for yourself? stunninggg! :) makeup looks suweeet too. wish people would send me makeup brushes! I love love Sigma brushes! I have been using the Face & Eyes kit for over a year now, and a couple of months ago I bought the F80 brush. They are all of great quality and I won't change them with anything else anytime soon. Ahhh these brushes are on my birthday wish list. They make your make up look so professional! you're so so lucky! 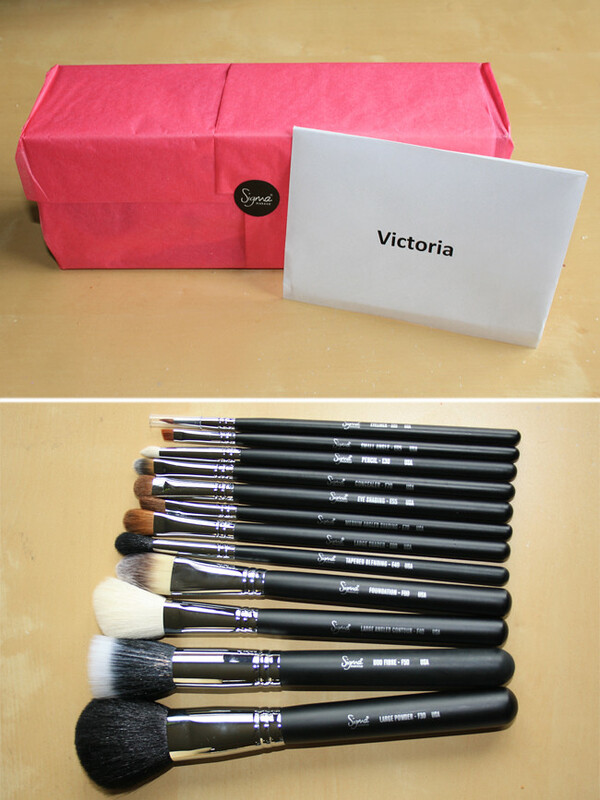 ive been wanting some of these brushes for so long, i love what you've done with your make up it looks stunning! well for a begginer, your makeup is super pretty! love it! Jeez I wish I could do eye makeup like that! No matter how many tutorials I watch I'm just totally cackhanded! I need some decent brushes for wedding makeup- no point buying decent makeup then using my grubby mitts to apply is there? I'm definitely keen for a set of these- so much cheaper then MAC and great results! I only want to buy those brushes but the kit i want is so expensive! x_x (and i didn't even want to look at the shipping). Am super jealous, they look amazing, i'm saving up to buy some at the moment, few more shifts at work first though! Really like your eye make up in the photo too, would love to be able to do something like that but i'm completely useless when it comes to make up! Haha I'm the same, I hardly know anything! It was only after stumbling upon some makeup youtubers recently I actually realised I could do alot more with my makeup and that it's worth splashing out a bit on good products. I like spending money on clothes, but makeup doesn't really interest me! Oh also, I love what you've done with your eyes and hair in the photo :) What foundation do you use? I also have zero knowledge on make up brushes! I might check these out because like you I also want to learn about them. Like you I don't really know much about make-up brushes at all. However, this set looks really crisp. They obviously do a very good job too because you look gorgeous! Those brushes look lovely! Cannot wait to get my hands on some of my own!! I love the flat top kabuki, the large powder brush the foundation f60(used to be f90?!) and the tapered brush by Sigma- all excellent!